What are fossil carbon dioxide emissions? Fossil fuels such as petroleum and natural gas were formed by decomposition of dead organisms, typically millions of years ago. They contain a high percentage of carbon. Fossil fuels are non-renewable resources and when they are burnt to generate energy, they produce carbon dioxide. Energy is needed in cartonboard and cartons production. If this energy is generated from fossil fuel, such as coal, petroleum and natural gas, then the emissions associated with using these resources are measured in terms of fossil carbon dioxide emissions. A carbon footprint of a product or service is a measurement of all greenhouse gas emissions (including carbon dioxide) during the life cycle of a product. It measures the impact of a product or service on the climate. The term relates to carbon dioxide which is the most common greenhouse gas and a major contributor to global warming. The unit of measure is a kg of CO2. When another greenhouse gas is measured, such as methane, it is converted into CO2 – eq (equivalent). Calculating carbon footprints can help us to understand how the products we use affect the environment and climate change. The aim of regularly measuring carbon footprints is to show that, over time, reductions have been made in the amount of emissions associated with the life cycle. 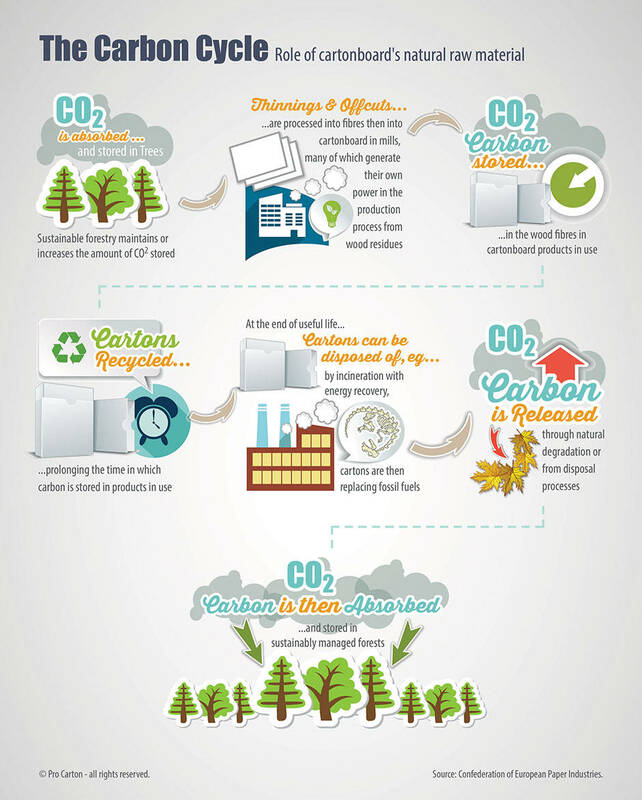 What is a carton’s Carbon Footprint? As every carton is made to a certain specification to be fit for a certain purpose, a single carton will have its own carbon footprint figure which needs to be calculated separately. In order to give a general indication of how many kilogrammes of carton dioxide are produced for each tonne of cartonboard which is converted, Pro Carton has calculated the average carbon footprint of all carton production in Europe. Pro Carton’s industry carbon footprint includes primary and recycled fibre cartonboard and printed cartons. Pro Carton’s industry carbon footprint is: 885 kilogrammes of carton dioxide (and equivalents) are produced for each tonne of cartonboard which is converted. For more detailed information, go to the Sustainability section. The capture and storage of carbon in all forest – based products including cartonboard, can be measured in biogenic carbon. Cartonboard’s raw material is wood fibre – the renewable resource of the sustainably managed forest. Growing trees capture and store carbon and when the wood fibre is processed into cartons, the carbon continues to be stored in the cartons. When cartons are recycled, the carbon is locked up even longer. The carton industry believes that using cartons helps to remove carbon from the atmosphere. In order to demonstrate this, a study has been commissioned to establish a positive link between the forests from which cartons are derived and the carton itself. For details go to the Sustainability section.